Indulge in a healthy breakfast or snack that tastes like your favorite Christmas cookie! 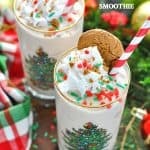 This easy Frosted Gingerbread Cookie Protein Smoothie recipe is a delicious and nutritious way to fuel your body and satisfy your sweet tooth -- in just 2 minutes! Place all ingredients in a blender and process until thick and smooth. Garnish with toppings, if desired. Serve immediately! I typically make whey protein shake recipes, using either this protein powder or this protein powder. The protein powders add flavor, sweetness, and THICKNESS to the smoothie in a way that's hard to replicate with other ingredients. The protein also gives the breakfast smoothie staying power so that I'm not hungry an hour later. If you prefer a vegan protein smoothie recipe, you can substitute with a plant based protein powder and almond milk (or other non-dairy milk). I have not tested this recipe with a vegan protein powder, so please note that the taste and texture will be different. I don't give my kids protein smoothie recipes with protein powder. Instead, you can make this protein smoothie recipe without protein powder by substituting with a cup or so of thick, creamy Greek yogurt. Since you're omitting the sweetness of the protein powder, I recommend using a sweetened vanilla-flavored Greek yogurt or using a plain Greek yogurt that you sweeten yourself with maple syrup. To give your protein shake that thick, creamy milkshake-like consistency that you can eat with a spoon, be sure to use a lot of ice and just a small amount of liquid. Start with about 1/2 cup of milk and then add more, as necessary, just until it blends. For purposes of calculating nutritional information, I used Quest Vanilla Milkshake protein powder, which has 100 calories per scoop. If you use a different protein powder, nutrition stats will vary.